The ‘Naked Bell Assembly’ is a finger-tip throttle assembly using our 50° 10K pot. It has a spring return to zero and is supplied with a mounting bracket and a vinyl-capped lever. The naked bell throttle assembly is a finger-tip throttle assembly (speed control mechanism) using the 50° 10K pot. It has a spring return to zero and is supplied with a mounting bracket and a vinyl-capped lever. 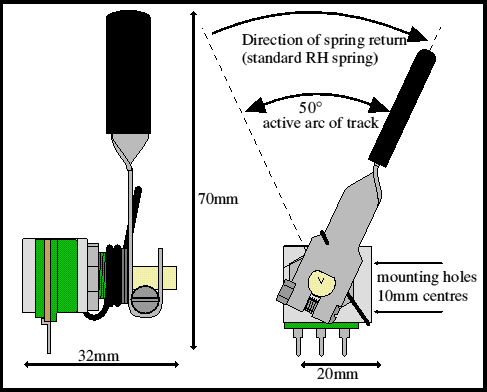 The spring is light operation to minimise finger strain from continuous pressure on an over-strength spring, yet is still strong enough to ensure reliable operation. The lever can safely be bent if a different shape is needed. 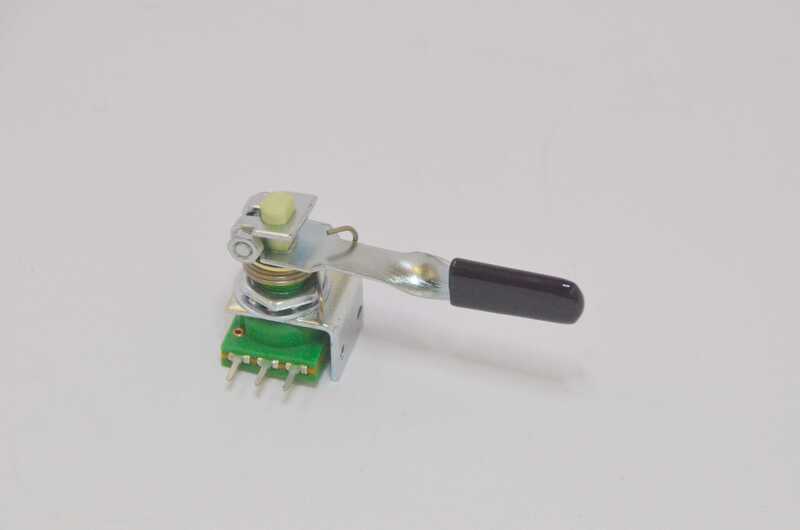 The mechanism is also quite suitable for use as a position sensor, for instance in a foot operated pedal, where the lever can be operated by an extension of the foot pedal. An application note shows how. Travel end stops usually need to be incorporated in the mounting you use, and should limit travel to about the centre 50 degrees of the mechanical movement. It is possible to use this mechanism with a Bowden cable for remote operation. If you aren’t sure which version you need, there is more information in the manual. You can purchase the left-hand spring separately. The drawing above is the standard assembly with right-hand spring. The right hand spring throws the lever to the left for zero speed. The left hand spring throws the lever to the right.